Treatments to correct injuries and disorders of the spine can vary widely, but in many instances a back brace is an effective method for allowing patients to minimize pain, correct irregularities, speed recovery and/or regain an active lifestyle. Children with scoliosis are most often prescribed a TLSO brace. These braces provide back support and limit the progression of a spinal curvature as the individual grows. The Boston Brace is the most common back brace in use for scoliosis treatment. It corrects curvatures with small pads that are fitted against the ribs. The body is held upright and experiences pressure towards the front of the brace body. It extends from the hip to the tip of the shoulder blade. Most patients wear the brace for 20 to 23 hours each day. It can be removed to participate in physical activities, however. The Boston Brace is most effective in treating curves in the lumbar and thoraco-lumbar area of the spine. Back braces can come in two different forms – soft and rigid. The Boston Brace is a rigid brace, often comprised of molded plastic which is specifically fitted to the patient. In addition to scoliosis, the TLSO or Boston Brace is commonly used to help patients that have experienced a fracture or undergone fusion operations. A TLSO minimizes discomfort for the patient and actually assist in the healing process. There are also back braces that feature slight variations of the standard TLSO Brace. The Cervico-Thoraco-Lumbo-Sacral-Orthosis Brace is one example. This brace is similar to the Boston Brace in the method of support it utilizes. However, it incorporates bars which extend from the body towards the head. Attached to these bars is a ring designed to support the patient's neck. This brace is still considered a form of the TLSO Brace. Some patients benefit from wearing braces throughout the night. To minimize discomfort and encourage a good night of sleep, patients are often prescribed a Charleston Bending Brace. This brace is molded specifically to the body of the patient as well. Choosing the right type of brace depends heavily upon the condition and specific support needed. Physicians are an invaluable resource for guiding patients in their choice of equipment. Most back braces can be outfitted with additional accessories to provide more stability in certain areas of the spine. 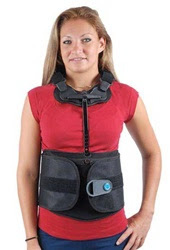 These accessories include items such as lateral shoulder supports. A variety of plastics and technological advances have also allowed for the development of braces that are less visible, more supportive and can easily be worn under clothing.